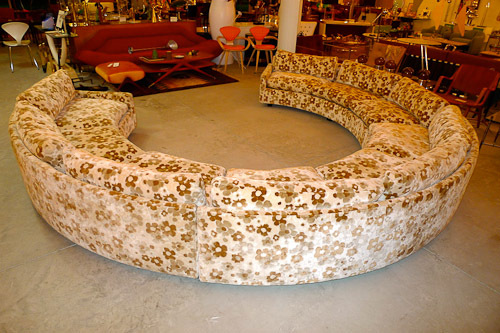 Oh Milo Baughman for Thayer Coggin 1960s round sofa sectional in original gold and taupe flower power print, how beautiful art thou. 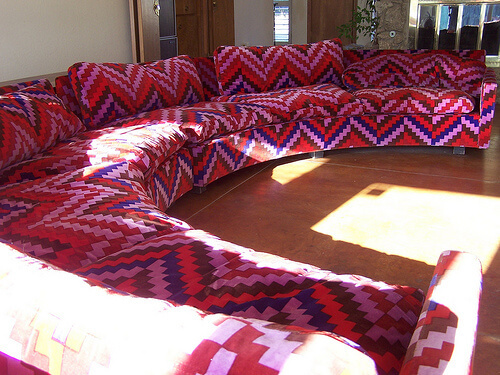 I bumped into this sofa while researching another story. It is my new dream sofa. Is a “neutral flower power” design an oxymoron? Alas (or thank goodness), it is sold. Looks like it was $9,800. The sofa is from BG Galleries in Hingham, Mass. — not too far from me at all, I must go. You can look at lots of delicious photos from this store on BG Galleries’ Facebook page; warning: it is a black hole where the space/time continuum and your pocketbook will likely fracture. The store won “Best of Boston 2011”. 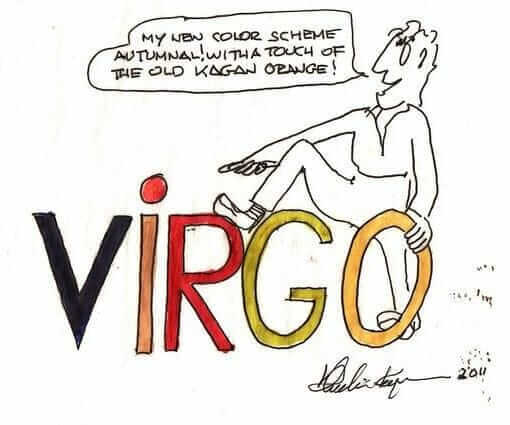 The magazine says it has a “cult-like following” among in-the-know designers. 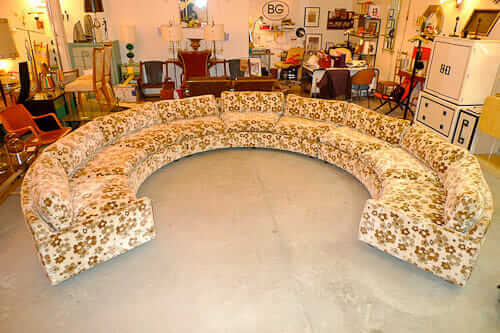 BG’s 1st Dibs auctions are here; I believe this is where McDreamy met its new match. Thank you, BG Galleries owner Peter, for giving me permission to feature all these photos. It was fun kibbitzing with you online Friday night; we have no life; oh, yes we do: Mid Mod Madness. The Milo above — which I featured on the blog several years ago — is equally round-licious. 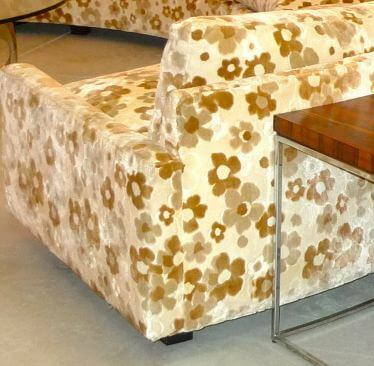 Can you believe the owner — a flickr friend (click to the photo above to get to her flickr page) — once entered it in a nation’s ugliest sofa contest? I know that she knows now — what with the midcentury modern crazed design world finally arrived — that her sofa (purchased for a song 10 years ago) is an absolute treasure. See? See! It’s all about perspective— we think (or are told) things are *ugly* when they are in an unpopular phase… but then like 50 years pass, and we realize (or are told) they are *beautiful*. Fashion is so silly. And oh, guess what? You can still get a smaller (it seems?) version of this sofa from Thayer Coggin today. Yes, they have a Milo line. I’m gonna guess it costs as much as a new small car. 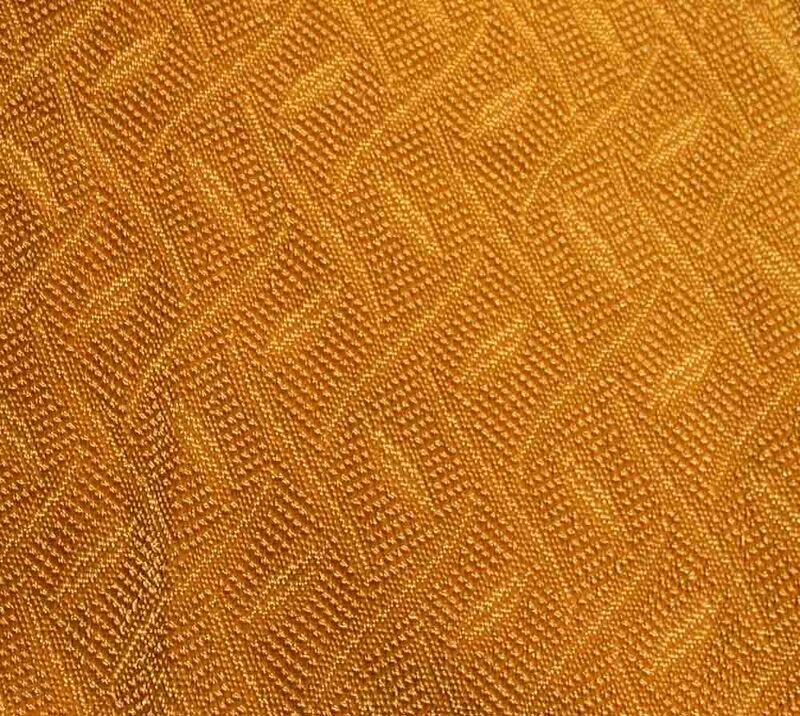 And it wouldn’t include 1960s, mid mod velvet gold and brown flower power upholstery. 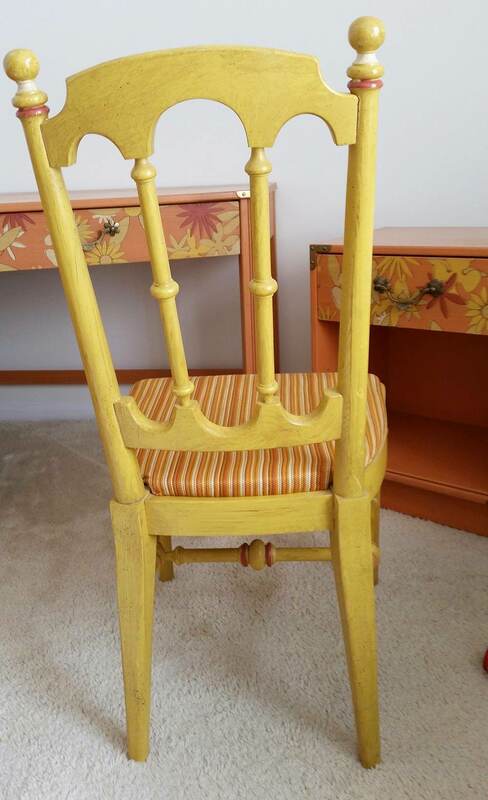 Are there more of you vintage Milos… original crazy upholstery… out there in the wild… awaiting for your renewed glory? Reveal yourself, we love you. I’ve been in love with that beautiful and perfect sofa for a long time. Sometimes I go to my pintrest just to gaze at it longingly. The closest I’ll likely ever get is the cool phone cover I bought for my cell phone. 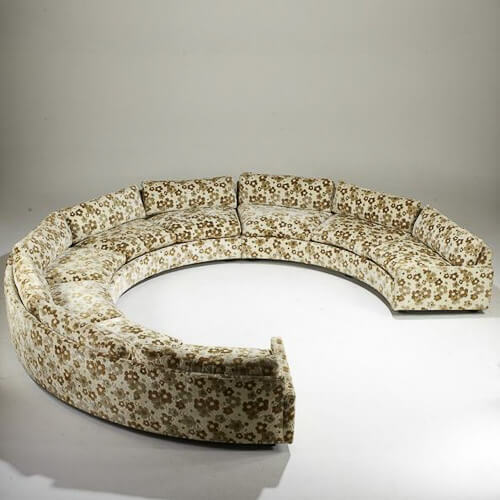 Friends some over and we start talking about retro goodies -> I pull up pintrest so they can see the amazing neutral powerful flower sofa -> then show them my phone with the case that looks like it was designed with that sofa in mind -> many ooo’s and aahhh’s. If it was anything else it might be considered a problem, but when folks finally see that sofa they totally get it! I just picked up this sofa from an estate sale in a nubby mustard yellow fabric and the circular revolving coffe table to match! It’s AMAZING. I can’t wait to get home and just look at it! Sigh! Happiness is a mustard yellow, scratchy retro couch! WOAH this is the one i want!!! I’m happy to send a pic!